Apple Music is a music streaming service by Apple Inc. With it, users can play and listen to music they like, download music songs, and use the blog platform Connect for artists to share media with fans. You can also get recommendations based on your taste. It is integrated with Siri voice commands. 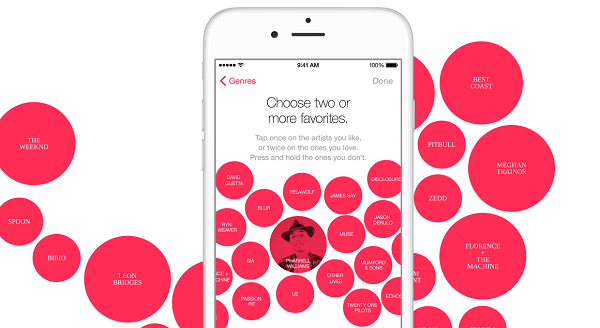 If you are an Apple fan, you will choose Apple Music absolutely. Each new iPhone users will be automatically installed. This September iPhone 7 will be released. There will be more and more Apple Music users as well. Related read: Apple Music Converter. If you don't have an iPhone, you can also use Apple Music via the Apple Music app for Android. Android App, just as Google Play Music is available on iOS. You can not only listen to music via Apple Music, you can also upload music to Apple Music, for Apple will accept submissions for inclusion on Apple Music. You can find its App Store guidelines to know more details. For Apple Music new users, it supports a three-month free trial to let users know more and better about Apple Music and how it compares to other similar streaming music services, and then you can decide whether you will subscribe the Apple Music or not. Apple Music costs $9.99 per month for a standard dose of all-you-can-eat music streaming or $14.99 for a family package which gives access for up to six people. The Apple Music library features over 30 million songs from iTunes, though that's not the full amount of tracks available to buy from Apple's iTunes Store - there are more than 10 million tracks missing. You can see the Music recommendations in the For You section of the app, and this can improve over time to let the app know what you like and don't like. You can tell Apple Music that you're enjoying a song by tapping the heart icon at any time, and you can tell it not to recommend that again by tapping and holding, and then pressing "I don't like this suggestion." With Connect, it lets artists post videos, photos, messages and more for fans to see, like and comment on. Users are unable to post their own content, but can interact with the posts from their favourite artists. Apple Music now only streams at a 256Kbps bitrate, which makes it lower than Spotify's Premium 320Kbps. Apple Music can only work on iOS, Apple Watch, Macs, PCs, and Android devices. But Spotify covers all those platforms and also Roku, Amazon Fire devices, a range of speakers and stereos, and PlayStation 3 and 4. Apple Music for Android works only for those who have a subscription. On iOS, Beats 1 Radio, Apple Music radio stations, and Connect are free.